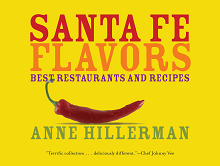 Santa Fe Flavors is a must-read book for flatlanders visiting the fair burg: libations will have greater effect at a high-altitude, it is more difficult to keep food hot, bread rises more quickly, and blue corn is not spoiled but delicious and nutritious. Recommendations for dining-out commence the guide with a break-down of cuisine unique to the Southwest, including posole, green chile, calabacitas, and piñons. The subsequent chapters are divided into recipes for mains, sides, drinks, and desserts from local favorites like Harry's Roadhouse, Coyote Cafe, and Cowgirl Bar and Grill. Hillerman's guide is all that is needed for high-desert frivolity. Buen provecho!